September Workshops and Back to School Celebrations! The September Class Calendar is up and I can’t tell you how excited I am about this month’s projects. Jessie is on a roll and her true “cherished” style is in full-force! Classes are held on Sundays and Wednesdays, so click on the calendar to see them. Or better yet, stop by the store to see the creations in real life…these internet photos do not do them justice! Personally, her “First Twelve Months” Watchmakers tin is my favourite (photo shown here)! It’ll be the perfect present for Grandma…yes, I’m starting my Christmas gifts early this year! Also at the store are the three layouts for my new “Take Three” class. 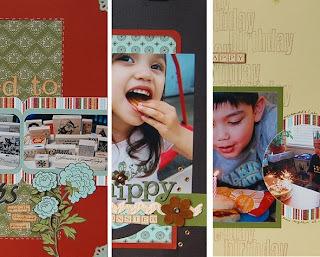 “Take Three” is a new layout class where we take three pieces of patterned paper and cardstock to make three unique 12×12 layouts. This class will run each month and feature different patterned papers and techniques each time. “Take Three – Dreamstreet” runs Sept. 14 (1pm), Sept. 17 (10:30am and 6:00pm). Contact the store for more information or to sign-up. October’s “Take Three” class will be feature paper by Collage Press. Also running in the month of September is Jessie’s “Back to School” Celebration, where she will feature a different demo and special EVERYDAY in September (YEAH…a new demo everyday…that Jessie is CRAZY!). Take a look at the schedule, and visit the store on your favourite days. At the end of the month, you’ll have a Technique Tag book…a great little reference guide to keep you inspired.